Charles Taylor Service Details - Toledo, Ohio | The House of Day Funeral Service, Inc.
Charles Bernard Taylor departed this life at the Kingston in Sylvania on Oct. 3, 2018 after a long battle with Alzheimer's disease. Charles was born on July 18, 1931 in Blytheville, Ark. to Dr. E. C. and Lucille Taylor. The family moved to Toledo, Ohio when he was six years old. As the oldest of 10, Charles always looked after the family and he became the counselor and adviser to many. The family nicknamed him the "Godfather." A graduate of Scott High School, he served his country during the Korean War. As a member of the United States Air Force he was stationed in Korea and Japan. He attained the rank of Staff Sergeant before being honorably discharged. After returning to Toledo, he worked for the U.S Postal Service, and then became a manager at W.T. Grant department store at the Swayne Field shopping plaza. In 1967, Charles was hired as a Tax Collector Investigator for the City of Toledo, in the City Tax Division. In 1983, Charles was promoted to the Tax Administrator position, which he held until his retirement, in 1989. He also started his own company CDA tax preparation in the early 1970's. Charles was an avid card player and Bid Whist was his favorite game at family get togethers. He also enjoyed bowling and he loved being on the golf course. He was a faithful member of First Church of God for many years and served as church Treasurer for several years. Charles often said that "family is everything," and he spent his life caring for and uplifting his loved-ones. 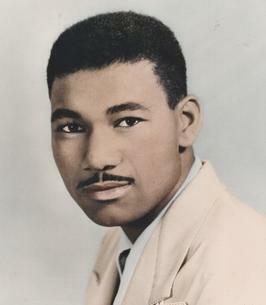 He was preceded in death by his parents, his loving wife Catharie Bell Taylor, sisters, Betty Conner and Ernestine Wiggins and brothers Larry Taylor and Ronald Mosely. Charles is survived his children, Darrell (Marlene)Taylor, Pamela (Derrick) Robinson, Arthur (Marna) Taylor, and Serena (David) Rayford; grandchildren, Ashley Taylor, Darrell Taylor Jr., Juliana Taylor, David Rayford Jr., Anika McCants-Brown (Jason), Janessa(Daniel) N'Guessan, Jason Rayford, Lauren Robinson, Christopher (Deborah), Rayford, Juliana Taylor, Jessica Spigner, Justin Spigner; great-grandchildren, Jalen, Skylar, Anaya, Ian, Rhyan, Phoenix, Jason Jr., Dominic, Dorian and Aurora; brothers Sammie, Alvin, Ernest and Pierre (Alethea) Taylor, and Edgar Mosely. To send flowers to the family of Charles Bernard Taylor, please visit our Heartfelt Sympathies Store. Now and in the days ahead, may Jesus our God of comfort hold you all in the palm of His hand as you remember Charles' life legacy and celebrate his home going to Heaven, alive and well in the presence of our risen Lord, King Jesus. PEACEWITHGOD.NET has been a source of hope & inspiration and we thoughtfully share. The Mosley family of Altadena, West Covina, and Venice, California extend there heartfelt sympathies to the Taylor family. The resurrection hope lifts our spirits in this time of sorrow. It is hoped that this guarantee from our Heavenly Father will support and sustain all of you during your time of grieving. Carolyn, Ronald, Ronda, & Veronica.